What are our recruiting fees? 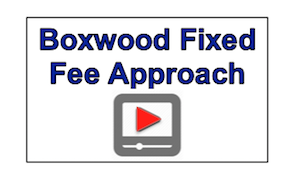 Boxwood has a fixed fee / flat fee model with no surprises or hidden costs. Our average fee range is between 21%-30% of the first year cash compensation of the newly hired talent. All of our recruiting engagements have unique circumstances and challenges. We invest the necessary time to understand what talent our client needs, why it is needed and when it is needed. Based upon our experience, we present our proposed fee. Once we have an agreement with our client, all efforts move forward to focus on acquiring the best fit for our client. We believe that hiring critical talent is a formal event. Once hired, we are 100% committed to successfully completing the recruiting engagement. Have you considered the total cost of recruiting?